Following the Romanian elections of 1912, he became a parliamentarian with the Conservative-Democrat Party led by Take Ionescu, and five years later he became a member of the government of Ion I. C. Bratianu as Minister of Finance. In the summer of 1918, together with other prominent Romanians (Take Ionescu, Octavian Goga, Traian Vuia, Constantin Mille), Titulescu formed, in Paris, the National Romanian Committee, with the purpose of promoting in international public opinion the right of the Romanian people to national unity, the committee being officially recognised as the plenipotentiary de facto organ of the Romanian nation. From 1927 to 1928, Titulescu was the Minister of Foreign Affairs. Beginning in 1921, Titulescu functioned as the permanent representative of Romania to the League of Nations in Geneva. 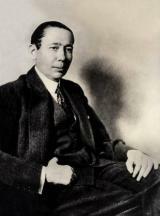 He was chosen twice (in 1930 and 1931) to be the President of that organization. In this capacity, he fought for the preservation of stable borders through the maintenance of peace, for good relations between both large and small neighbouring states, for the respect of the sovereignty and equality of all nations in the international community, for collective security, and the prevention of aggression. In June 1936, Titulescu famously reacted to the buffoonery exhibited by the Italian journalists when Emperor Haile Selassie I spoke to the League after Ethiopia had been invaded and occupied by Fascist Italy. He jumped to his feet and shouted: "To the door with the savages!" ("A la porte les sauvages!"). Later in 1936, King Carol II removed Titulescu from all official positions, asking him to leave the country. Settling first in Switzerland, he later moved to France. While in exile, Nicolae Titulescu continued through conferences and newspaper articles to propagate the idea of the preservation of peace, perceiving the danger of a war that was to come all too soon after. He returned to Romania in November, 1937, partly through the efforts of Iuliu Maniu. In 1937, Titulescu again left Romania and took refuge in France. At Cannes, he denounced the Romanian Fascist regime. In 1941, Nicolae Titulescu died in Cannes following a long illness. In his will, he asked to be buried in Romania. In 1989, after the fall of the communist Romanian government during the Romanian Revolution, Titulescu's request became possible. On 14 March 1992, his remains were reburied in the Sfanta Ecaterina cemetery in Scheii Brasovului, next to St. Nicholas Church, Brasov.